Customers are caught in a dilemma now: whether to buy iPhone 5S or the next better iPhone 6 (Plus). This decision becomes even harder as iPhone 6/6+ is getting hot and iPhone 5S getting cheaper. 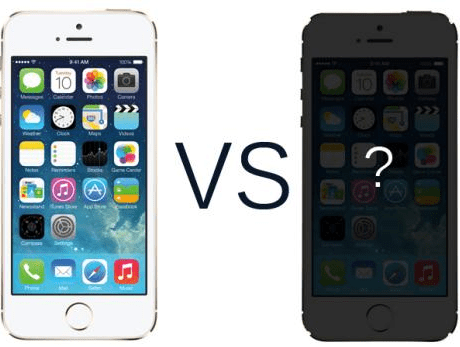 The answer to this question comes down to the differences between iPhone 6 and iPhone 5S and what the iPhone 6 will offer over the current iPhone 5S in all respects. To help them out of this quandary and to make an informed decision about whether to buy now or wait, here we make an iPhone 6 comparison with iPhone 5S in respects like features, display size, designs, speed etc based on the most viable rumors firmed up. 2015 you are supposed to think about buying iPhone 7 or iPhone 6 (Plus) or Samsung Galaxy S6? Below is a head-to-head comparison between iPhone 6 and iPhone 5S. The new iPhone 6 (Plus) spots an increase in the resolution. To introduce a phone with a much larger screen while keeping an iPhone 5 Retina-quality display, to increase the pixel count is the only way the company can go. The most common and sound suggestions point a bump up to 1334x750 resolution in the coming iPhone 6 up from 1136x640 px in iPhone 5S. The higher resolution makes iPhone 6 an ideal device to play videos, especially those in HD formats. The iPhone 5S features a 4-inch Retina Display much smaller than its Android competitors. Common criticism is that 4-inch screen is way smaller than many of the popular Android phones. But on the up-side, and what something that competitors like Samsung fail to reach, iPhone 5S is quite easy to use with one hand. However, the new iPhone 6 will come in two variants, 4.7-inch for iPhone 6 and 5.5-inch for iPhone 6 Plus. Both versions are larger than the current 4-inch iPhone 5S, which are finally released on Sep 9.
iPhone 5S's 8-megapixel camera might seem puny compared to many of its rivals in the market like Samsung Galaxy S5. Megapixels does not mean everything and is much less important than camera sensor size, and that is why iPhone 5S is still comparable. Few rumors expect that iPhone 6's camera will have an improved 8-megapixel camera sensor, up from 8-megapixel one of iPhone 5S. Among so many significant differences between iPhone 5S and iPhone 6, processor is one of the most important and common upgrades. Apple's A7 processor powered in iPhone 5S is a big leap and that's already extremely fast for a smartphone. iPhone 6 features a even faster CPU called A8, which will be a dual-core 2GHz processor up from dual-core 1.3GHz in iPhone 5S. The hardware of iPhone 6 is experiencing a great upgrade, so is the software. As Apple announced iOS 8 at the WWDC 2014 keynote, this Apple new mobile operating system will become available in iPhone 6. Maybe not too many changes to the design and functions will be seen as the upgrade from iOS 6 to iOS 7 was already one of the most significant improvement in Apple's software platform in years, many new features such as improved Message management tools, interactive notifications, support for third-part keyboards, iCloud Drive access, and a new health and fitness track app called Health can be expected. Battery life is an inevitable problem that Apple should address. iPhone 5S can work up to 10 hours on 3G with a standby time up to 250 hours. Longer battery life is another most called for improvements in iPhone 6. iPhone 6 is said to make a big step in this area against 5S by shutting down the unnecessary applications and features that may shorten the battery life and adjusting the colors and dimming the display. After the comparison between iPhone 6 and iPhone 5S, you may have an idea that iPhone 6 will certainly come along with much more upgrades compared with iPhone 5S. If the extremely fast speed, larger screen, higher resolution, rather different design etc all matter to you, the iPhone 6 really shake things up and you'd better wait for the its arrival. However, if you just want a cool smartphone to handle everyday needs, then iPhone 5S needs your serious consideration. The coming new features like higher resolution, bigger screen, faster speed etc make iPhone 6 an even better device, relative to iPhone 5S, to enjoy HD videos like DVDs. However, incompatibility between mobile devices and DVDs is an inevitable problem as the former is devoid of DVD drive which is essential for the latter. A proper DVD ripper can help you out easily. Here MacX DVD Ripper Pro is just the one you can rely on. This DVD ripper is capable of copying DVD to MP4, MOV, M4V, AVI, H.264 and other various popular video formats for playback on the latest Apple and Android devices without any hassle. Furthermore, if you want to download some YouTube videos and transfer them to iPhone 6/6+ or iPhone 5S to enjoy on the go, MacX Video Converter Pro would be exactly what you need. This video converter can not only download YouTube videos easily, but also convert various kinds of SD videos and HD videos like MOV, FLV, AVCHD, MTS, M2TS, AVI, MKV, WMV, etc to iPhone 6 video formats with high quality.